Nutella and peanut butter is the healthy parent’s solution to Reese’s peanut butter cups. A delicious dose of chocolatey hazelnut spread mixes with the gooey goodness of peanut butter to bring fresh life to plain old fiber-full wheat bread. 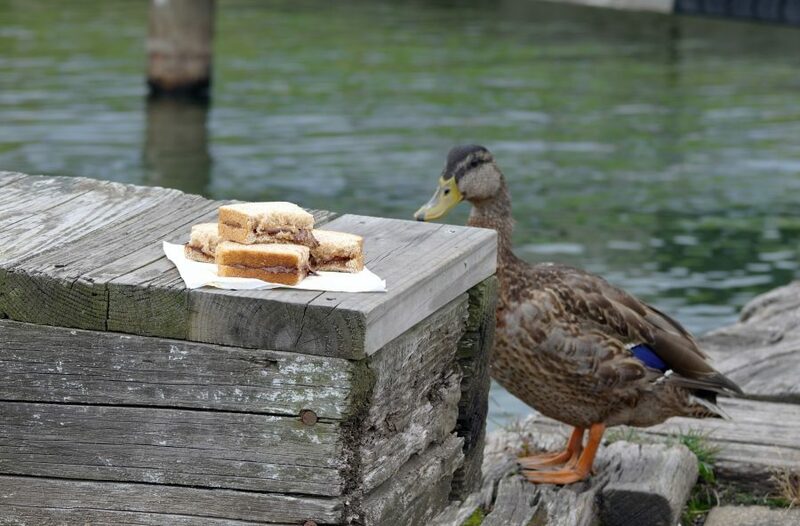 Even ducks can’t resist the lure of this yummy snack by the lakeside dock. But be careful– a peaceful afternoon could turn frustrating if you get too much of either spread on the top of your beak (or mouth). Keep some water or milk nearby, in case of emergency. The playfulness of youth combines with the sweet, wholesome flavors of the nutty earth to make any fan of sandwiches take pause and smile.